January 15, 2018 January 13, 2018 / Elizabeth T.
If you’ve had any look at recent runway trends from the past few seasons, you’ll notice that trousers have become increasingly popular. There’s just something about these chic bottoms that instantly elevate just about any look for a classier alternative, especially in comparison to regular denim. I haven’t been able to get enough of trousers, specifically these black ones. While they can seem boring and typical, and may even remind you of office wear, there are some fun and easy ways to instantly make the black trouser wearable for a casual outing or lunch date! While I typically veer towards a skinny and figure-hugging silhouette when choosing jeans in order to highlight my figure, I tend to do the complete opposite when it comes to trousers. There’s just something about the high-waisted, wide leg silhouette that’s so much more chic and effortless, and I love how it hugs your figure in all of the right places, yet provides so much comfort since it’s also loose-fitting as well. A big plus – a high-waisted pant really helps to highlight how small your waist is, so the looser silhouette doesn’t overshadow you at all! Though I love trousers, they also have the accidental tendency to be a bit more androgynous that your typical skinny jeans, since the looser silhouette and darker color can make it seem like men’s trousers. This is when feminine details, such as lace-ups, belts, and embellishments make all of the difference. I’ve been super attracted to fabric-like belts that offer a bow-tie front because the exaggerated bow is feminine without being too over-the-top, and this detail, paired with the high-waistline, further accentuates your waist, so your feminine figure is able to stand out. To highlight the waist even more, pairing trousers with a crop top can really help to give it a more modern, street-style vibe. There’s nothing more perfect to pair black with than white, and I love how this color combo makes for an instantly classy and timeless combo. And of course, a pair of fun sneakers really ties the whole look together for such a fun and quirky ensemble. I’ve been loving these velvet sneakers, especially since there’s a big bow on the front, which matches the bow-tie waist on the trousers. Together, this look is androgynous with the perfect touches of femininity through the details, and yet, the black trousers are anything but plain and boring, don’t you think? What are some of your favorite ways to style trousers? Are you a fan of high-waisted wide leg pants too? Let me know in the comments because I always love hearing from all of you! Such a lovely outfit! I haven’t worn pants in years! (I really feel comfortable only in my jeans) But after seeing this outfit I think I’ll probably be trying some on soon! Lovely outfit and such good advice! I’m saving this post for my next shopping trip! Thank you Olga! ❤ 🙂 And yesss, wide-legged trousers are really sooo comfortable! Love the ways you have styled these trousers babe! 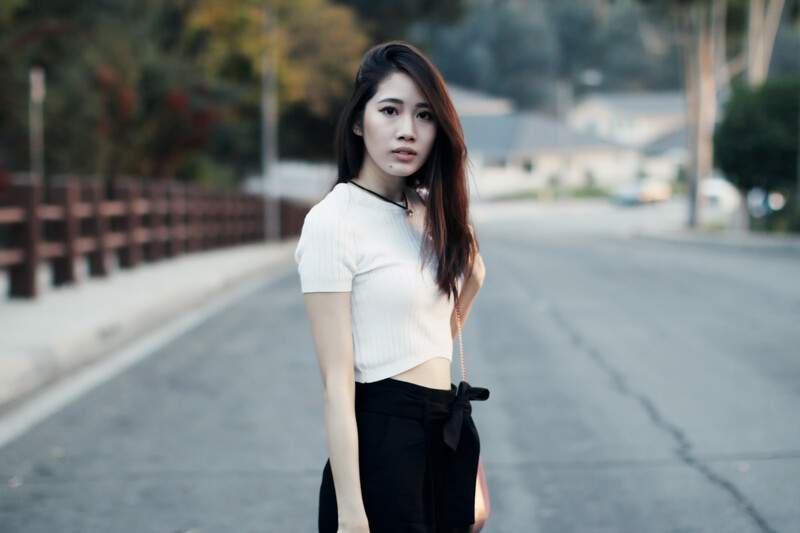 I love wearing crop tops with this style of pants too! I always think it’s hard to style wide legged trousers lol. Love the long fuzzy knit cardigan. 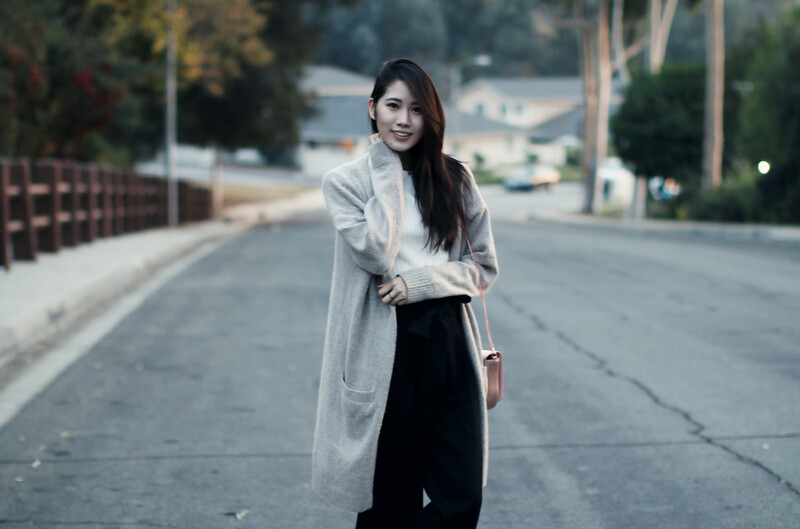 You styled these wide legged trousers so well! I love how you styled it with sneakers! Thank you Emma ❤ 🙂 Glad you like the look! These trousers are fantastic! Thanks for sharing these tips. Love these looks, so stylish! Loving all of the ways! & I love those trousers. The shape looks really comfortable too. Great tips, you look gorgeous! Thanks love! ❤ 🙂 You're too sweet! Love the trousers! You look fab! I don’t think I could pull them off but these are great tips! Wide-leg trousers are my favorite but sometimes, I hesitate on wearing them since, if not styled properly, it makes me look shorter than I am. But I love styling it with a fitted top! Love this post! Very useful! Yes, I’ve been loving high-waisted trousers so much ❤ 🙂 They're sooo chic and comfy! Love this look! The kitten bag is super cute!